I'm really enjoying working on these models. I'm about 80% done - the lower portion of the models are complete, as are the pilots (arms excepted). They are based and - IMHO - looking pretty good! 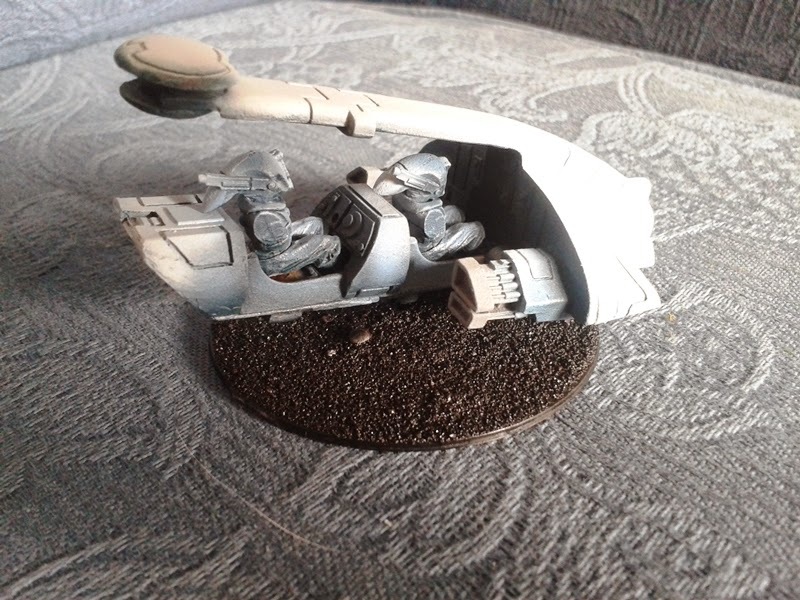 As I mentioned in my first post, this is my first go at airbrushing a vehicle of any kind and I'm feeling very happy with the result so far. 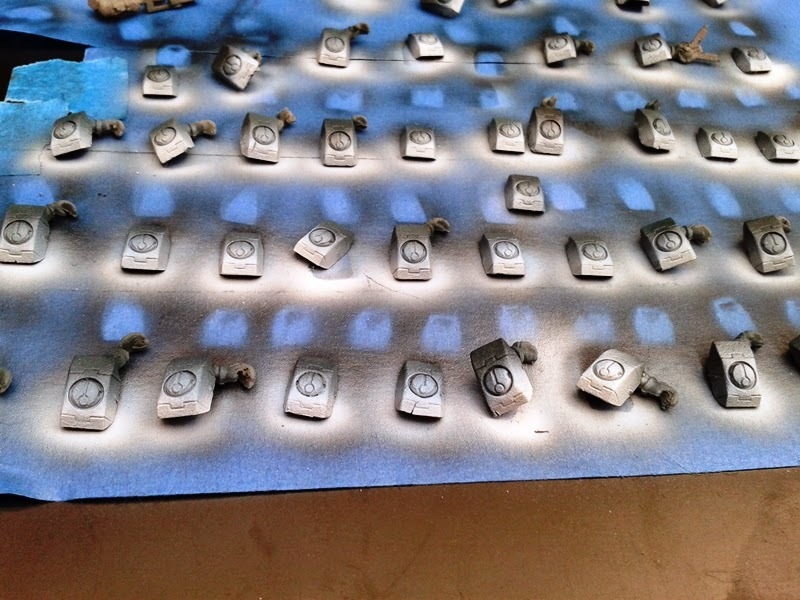 I'm determined to push my airbrushing nerves aside as I wrote in my "mission statement" so for the upper portion of the models I'm working on a digital camo paint effect - I should know soon if it's going to work. 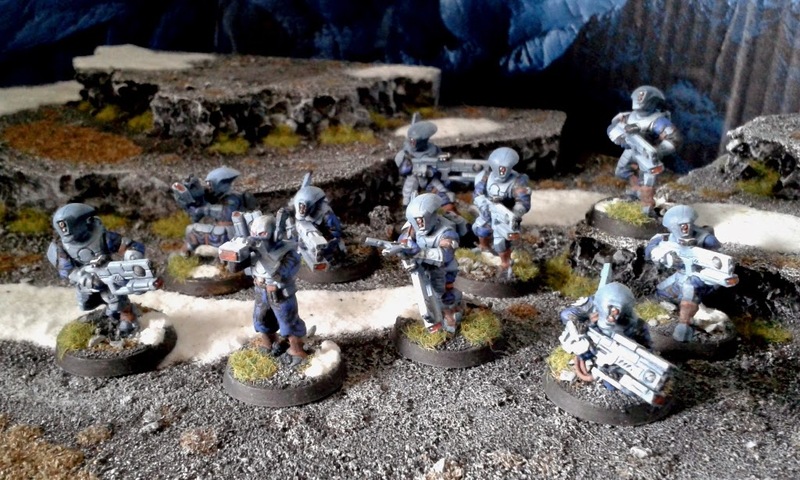 I'm busily (well, not really that busily) working on my first vehicle unit - a squadron of Tetra skimmers. Tetras are a fast-attack option, much like piranhas but are only armed with twin-linked pulse rifles and a markerlight. They are piloted by pathfinders. Now these are a long way from being finished and the photos below are a bit haphazard (please forgive me for that) but I'm enjoying working on them so much and so pleased by the results so far that I thought I'd share them. A lot of the colour hasn't come out too well in the photos - I'll try and do better for the finished articles. 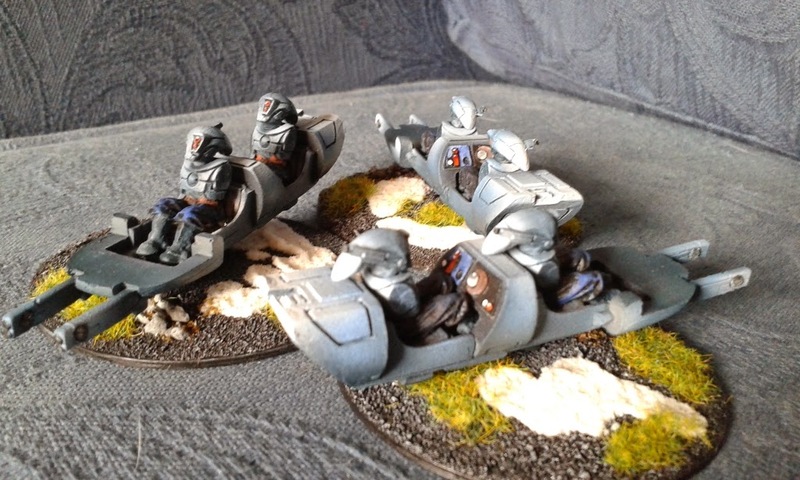 These are the three chassis for the Tetra squadron. Apart from some brush-work to pick up the console details, they're pretty much done. Here's a shot with the pilots and carapace resting in place, on a base. Obviously the pilots don't yet have arms and the engines need doing. And the same model from the front. 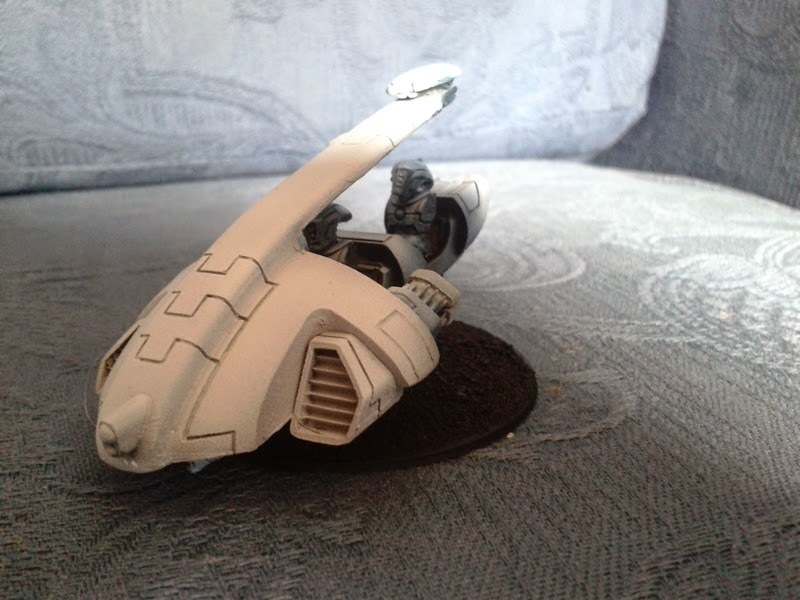 The white carapace isn't going to stay white - my intention is to stencil a digital camo effect on it. The keen-eyed amongst you will no doubt notice that only two of the models in this unit are actually "real" Pathfinder models - two old metal ones (the model dead-center and his twin on the far-right). 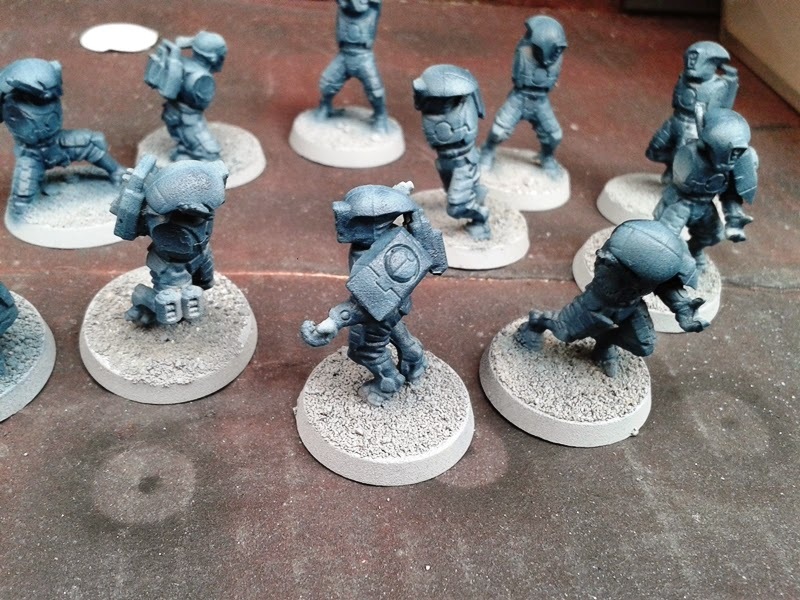 Most of the others are regular Fire Warriors and the chap with the binoculars is a tank-commander (but binocs seemed appropriate for a scout unit so...). I make no apologies for this - anyone who's seen my posts before will know I'm a miser who likes to kit-bash and renovate old junk and that's precisely what these guys are. I've simply left off the shoulder pads to denote their scout status. 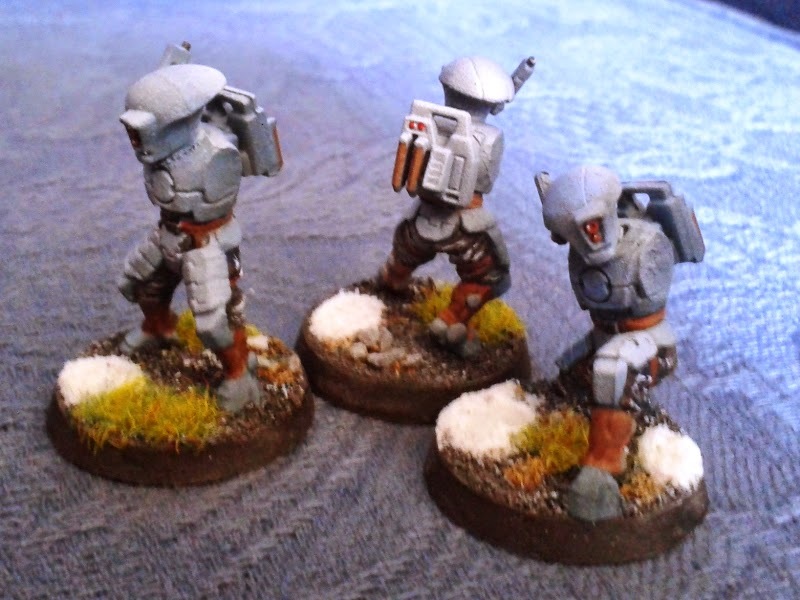 Seen from behind (which you can't do in this pic) there's another alteration in that I've replaced the regular Tau backpack with one of the small grenade jobbies which fits neatly on, looks like a small air-tank and again makes these guys look a little more "lightweight". I know I've harped back to my mission statement a few times now, but I'm actually taking it quite seriously. 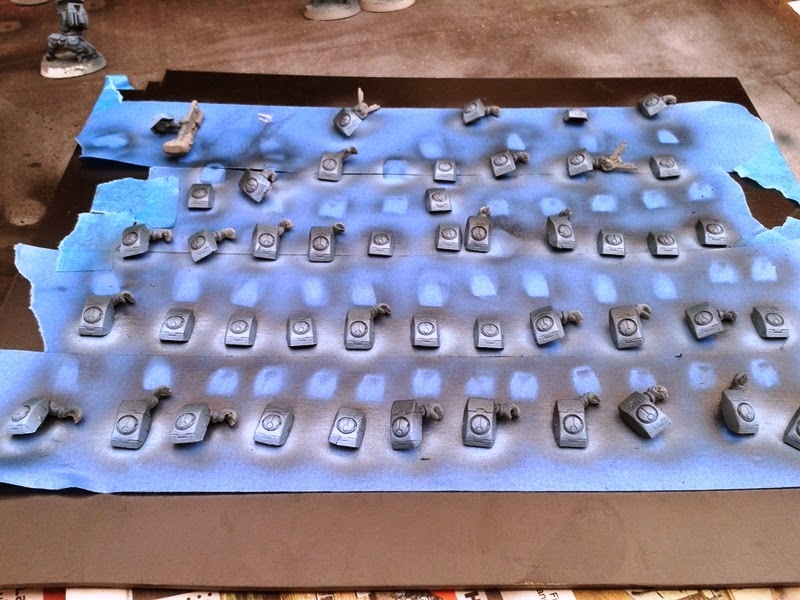 Especially the bit about airbrushing on every model in the army. I've been avoiding the airbrush for far too long before I started this project and I'm determined to address that. I saw a cracking youtube video by Medows on how he painted a riptide - I was really struck by the work he did on the riptide's nova shield - I loved the fact that it looked like it glowed from within with fire and I totally wanted to steal his technique and apply it to my army. I'm not ready to start on my own riptide yet, so I figured I'd start small - shoulder armour. 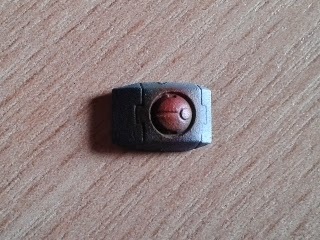 You've already seen in my First experiments with paint - Part 1 post that I'd used my airbrush to produce a graduated effect on the shoulder armour for my models - well I decided that I wanted the Tau Fire Warrior symbol to glow like Medows' riptide shield. It would help tie the whole army together as a force if I could repeat that detail across the whole army. So I set to work - I started by painting the symbol red, then yellow (both from Vallejo model air primary colours paint set) and then added a (minitaire) snow white highlight. I've done about 50 pads like this. Not all have turned out as well as the one above, but none are complete shockers either. I deliberately let the paint bleed out onto the main pad to achieve my first ever OSL effect. These pads aren't done yet - I intend to apply an oil wash to pick out the seams in the armour panels and the "lollipop" fire caste logo a bit later on. I think I've finalised my paint scheme. I deepened the brown on the gaiters and straps by overpainting it with a darker brown and then going back to my original brown as a highlight. I improved the lenses - I'd originally painted them red, orange highlight to the bottom-right, white dot to the upper-left. I didn't think this looked "deep" enough either, so I took the same dark brown I'd used for the gaiters/straps and overpainted the whole lens, then applied the red/orange/white on top of it. The backpack also picked up some dark/mid brown detail. Lastly the cloth got a haphazard white highlight. 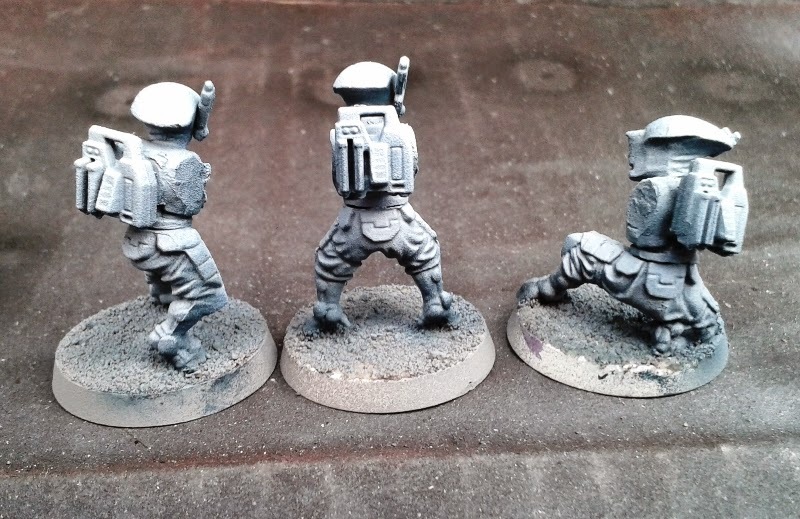 I still want to give these guys an oil wash to pick out seams in armour plates and deepen the recess on the backpack where the two red lights are. Obviously you can't see what I'm up to on the models' arms either. Sept markings need to be added too. Aside from that, I'm happy with these guys now and this is the scheme I'll be rolling out for the whole army. Burnt Umber (the dark brown colour). In a real rush and following on from Part 1, I threw some more paint at my test models last night. Belt buckle needs something, but I'm not sure what yet. Generally, on reflection with a bit more paint in places these guys are looking more "urban winter" than "snow" camo which is what I was originally aiming for, but I like the scheme so I'm going to stick with it. I couldn't resist any longer. I'm nowhere near finishing building all my models, but I'd ordered some paints the other day for this project and I had to try them out. I just couldn't not do it any longer. and the paint I ordered was for just that reason. A set of Minitaire paints from Barwell Bodyworks. 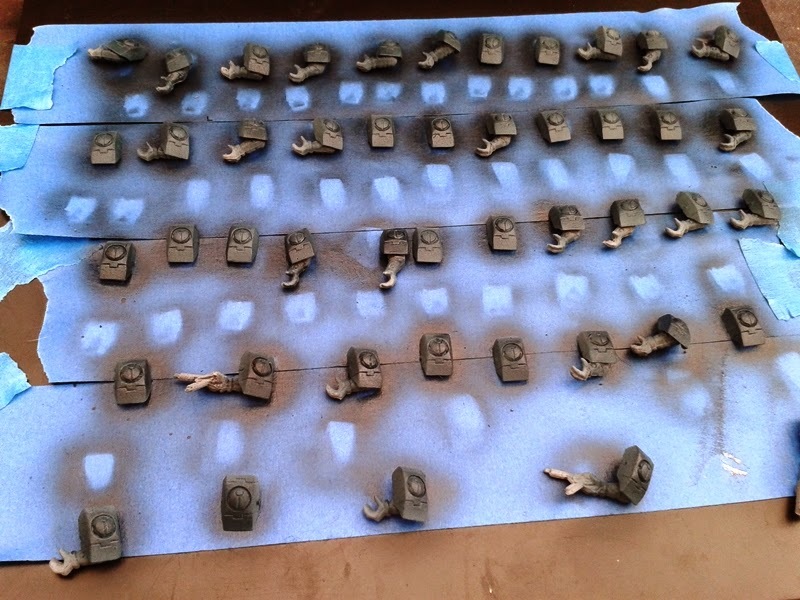 I had already primed my models using a rattlecan grey primer and set to work this morning on a few bits and pieces for testing purposes as much as anything else. You'll note some of the pads have arms attached and others don't. I'm building a lot of this force out of ebay cast-offs and had to strip a lot of models down. Some came apart better than others. I had some paint left in the airbrush so I shot it at a few fire warriors. Less paint leftover in the airbrush this time so only three models highlighted. 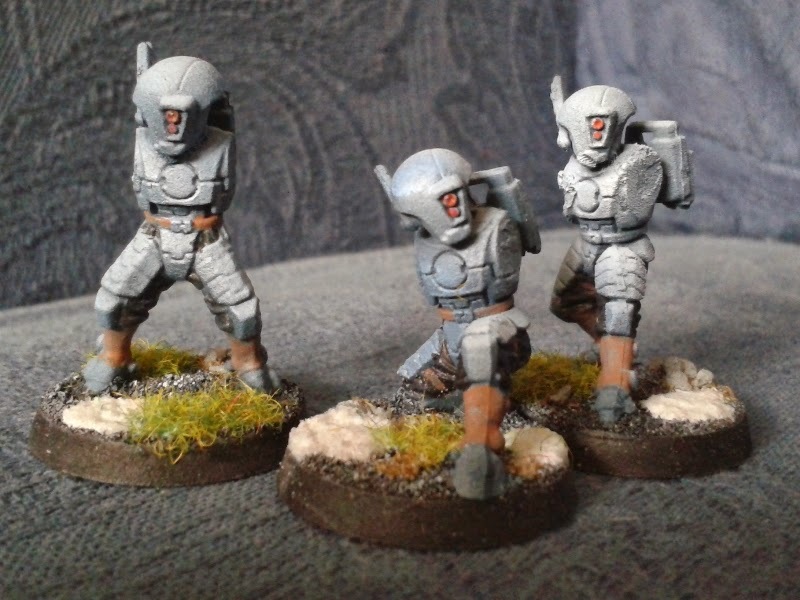 The photos (especially of the fire warriors) don't really do the result justice. 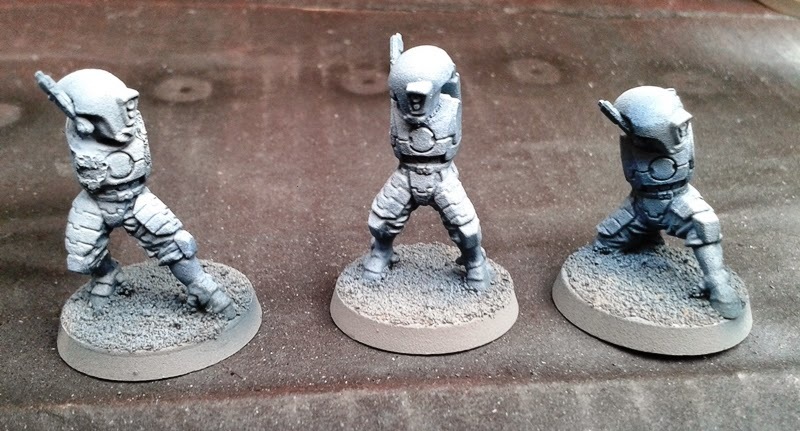 The models have a nice "ice blue" sort of a look to them, which is exactly what I was hoping for so I'm very pleased. I'm planning to get the rest of the arms and fire warriors to the same sort of level over the next few days and then brush-paint all the cloth bits of the armour. I'm also considering an oil wash to bring out some of the armour seams. I saw a really nice glowing-red effect on a Riptide Shield airbrushing video which I'm planning to rip off and am toying with the idea of picking out the Tau logo on the shoulder pads in the same way. This was my first go at doing anything other than basecoating or varnishing models with the airbrush and I'm very pleased with how it went. 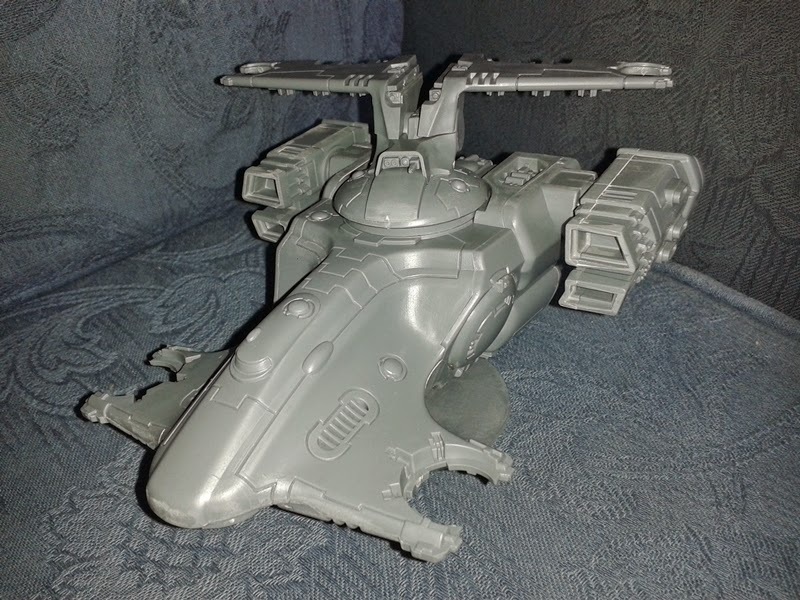 Whilst plodding (and I do mean plodding - progress has been way slower than I'd have liked) through building the models for my Tau army, I discovered what appears to be the most generously put-together GW model kit I've ever seen; the Skyray. Now I've owned my Skyray for a few years now, but until now it has stayed, unbuilt, in its box. 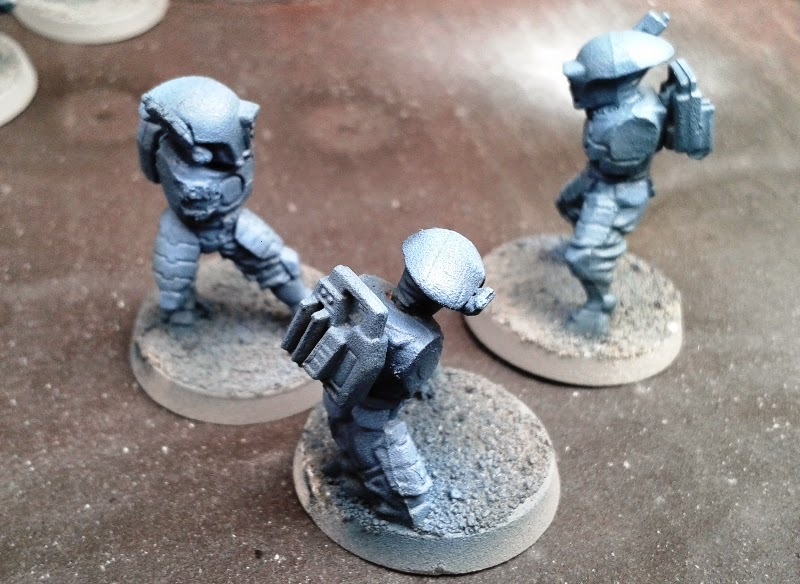 As a result, this post may be a little out-of-date as GW may have changed the contents of the kit. I don't know if they have or not - apologies if they have. Anyway, when I unboxed it, the first thing I thought was "Oh no! 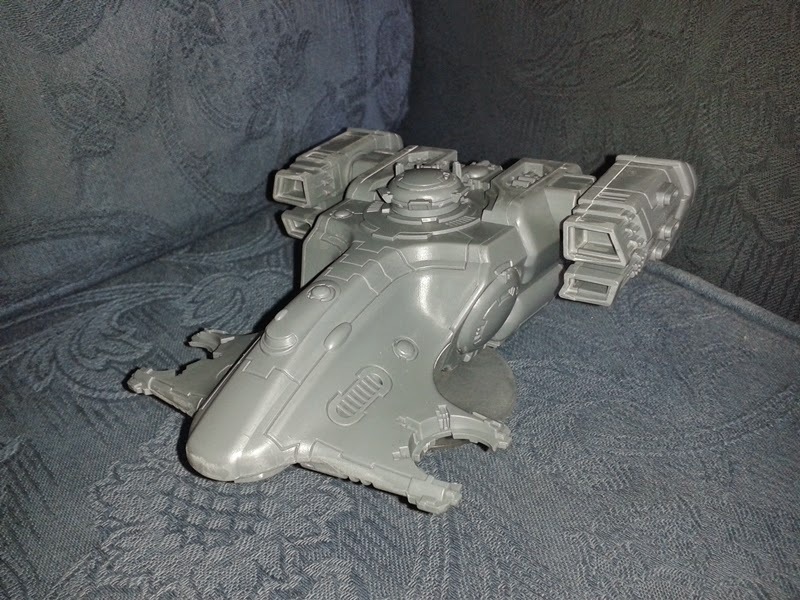 They've given me a Hammerhead in a Skyray box" - top of the pile was a sprue containing Ion Cannons and Railguns. But no! 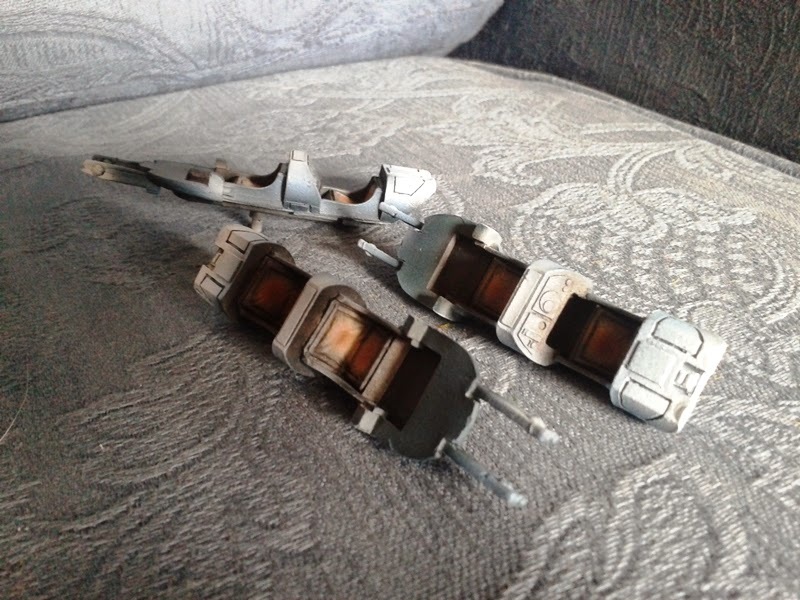 That Sprue is there because it also contains some parts which are common to both kits, namely the burst-cannon/missile-pod drones and the underslung sensor array that goes at the front of the mini. Looking at it a little harder, more possibilities opened up. The chassis - sensor-pod and turret not installed. If you stop short of glueing them into place at this point, you will find that they will all just quite nicely drop into the hole in the top of the Devilfish chassis. A Hammerhead with a Railgun. You can just see beyond the Railgun that the Devilfish turret drops in to the Hammerhead turret. A Hammerhead with an Ion Cannon. 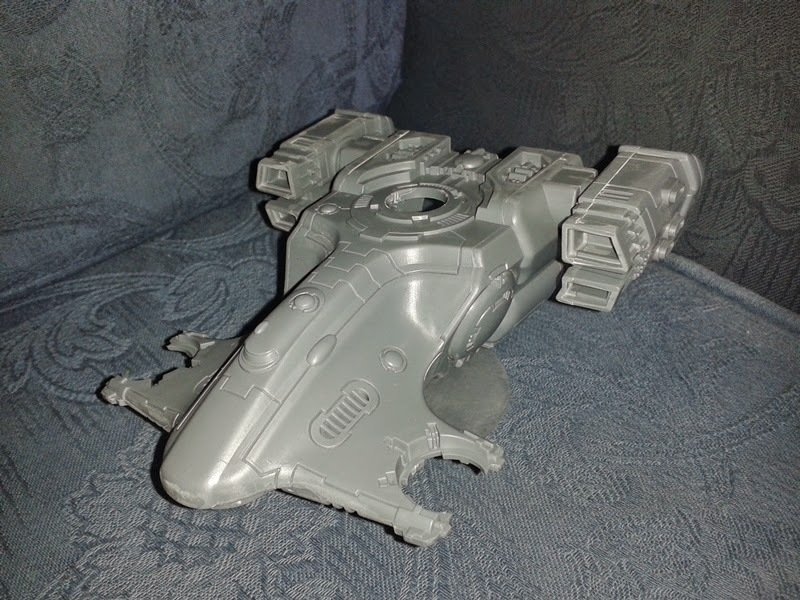 Now, if you also have a Devilfish kit or another Hammerhead or Skyray, you can probably already see possibilities opening up. You could build them all as Devilfish. 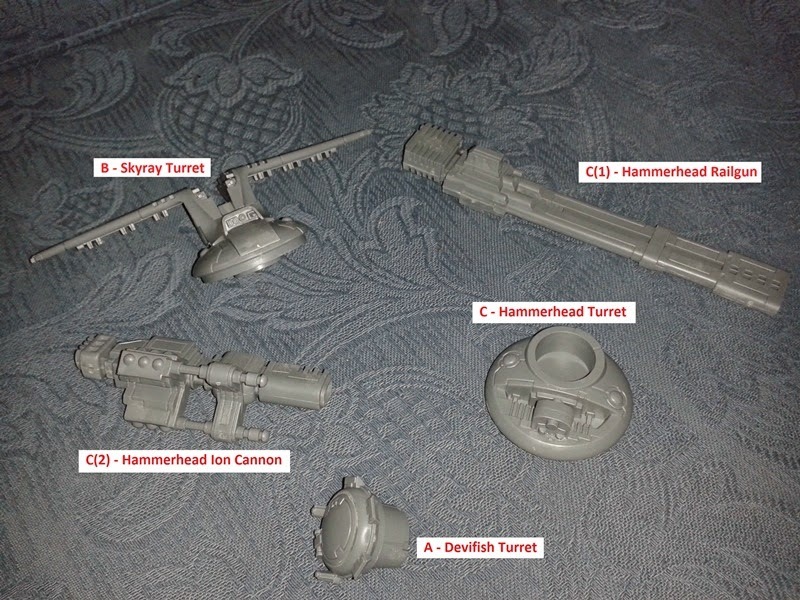 You could field a Hammerhead and a Skyray by dropping the appropriate turrets into the Devilfish. The possibilities are manifold and all can be just swapped and changed without glue, from one game to the next. GW are not known for unstinting generosity. They stinted (is that a word?) here too. 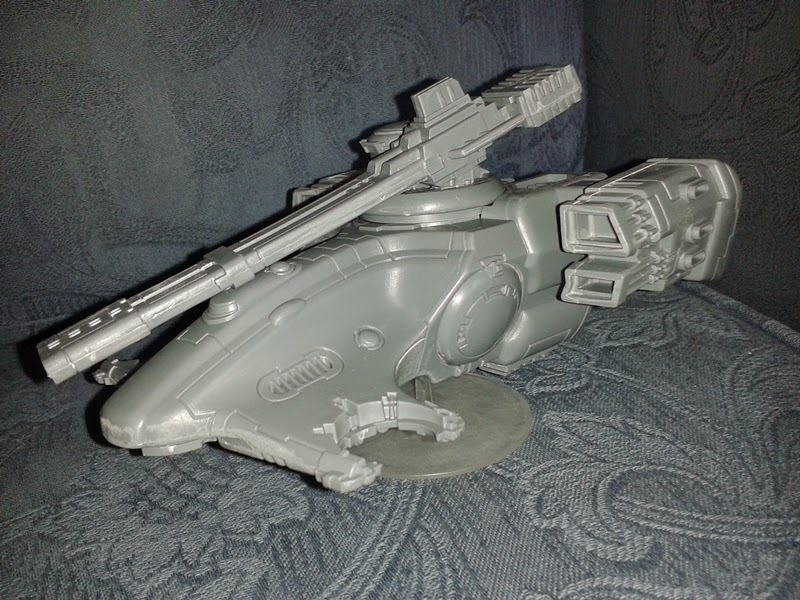 The Devilfish normally carries gun drones. The Hammerhead and Skyray don't come with any of these so if you want to field your tank as a transport you'll need to find some from somewhere, or purchase an upgraded weapon system for your transport. In addition, some modelling skill is going to be required. You may notice that in the above Hammerhead photos the weapons are hanging limply on the turret. They are designed to be glued in place. 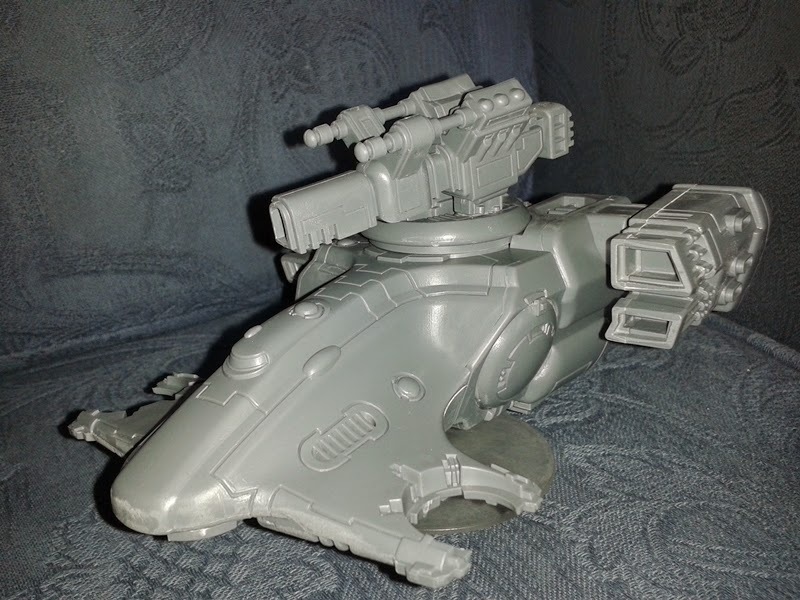 Also, the underslung turret does not lend itself to easy swapping and as the Devilfish sports a burst cannon and the Skyray and Hammerhead carry a sensor array, some work is required to make them interchangeable.